The Godfather Trilogy, a collection of films which defined the possibility of creating art in film in the 20th century has reached its 45th anniversary, 45 years since audiences first laid eyes on the Corleone clan. To begin to describe the cultural, artistic or social impact of the trilogy is in of itself a monumental task, the landmark use of cinematography, the acerbic script and star-studded cast ensured that The Godfather Trilogy remains ensconced at the top of all-time greatest lists. This original 1972 film – which is due for rerelease along with its two sequels – is perhaps the most significant film of the 20th century, with Chinatown (1972) and The Shawshank Redemption (1994) perhaps vying for that illustrious crown. It was certainly the zenith of the Hollywood New Wave of the 1970’s – topped only by its immediate successor, The Godfather pt. II. 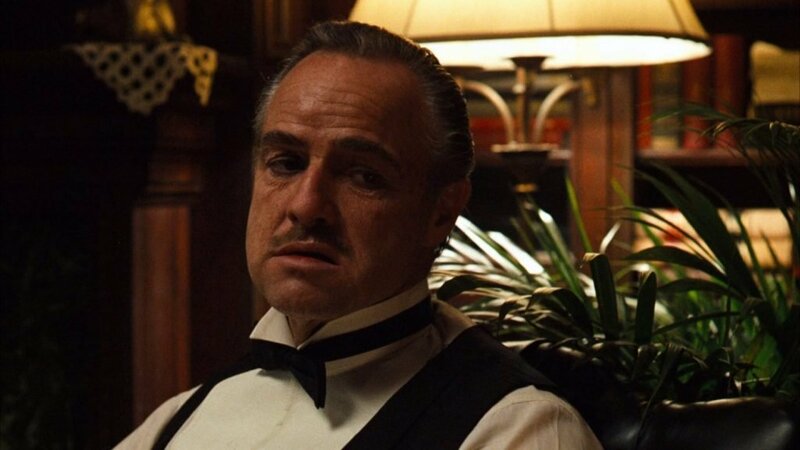 Indeed, the plot of the trilogy revolves around the dynastic struggles of the Corleone crime family, headed by Marlon Brando’s wizened Don Corleone. Adapted lavishly from the critically acclaimed The Godfather by Mario Puzo, it is a film which reaches out dark tendrils and shines new light into the dark underbelly of crime, including the various rules, codes and artifices which protect this shadowy world from outside interference. The cinematography of the trilogy is a striking contrast to preceding pictures. In the years before 1972, movies were consistently over lighted affairs to assuage the drive-in movie crowd and ensure that none of the on-screen development was lost in translation. Indeed, award-winning and highly lauded Gordon Willis elucidated on his process. The craft came from a desire to reflect the internal mechanisms of the human thought process (“in my mind, it was based on evil; it was based on the soul of the picture”). Certainly, this striking visual style is emboldened by the differing use of light to structure each segment of the reality of the Trilogy. For instance, the wedding which opens Pt. I outside had a distinctly Kodachrome feel which suited the environs of 1942.; moreover, the overall technical strength of the Trilogy came from a simple approach. The darker elements of the plot demanded an opaque almost Chiaroscuro effect, inspired by Marlene Dietrich features such as 1932’s Shanghai Express in which the brutality, violence and lurking menace corresponded visually with the monologues and diatribes. The overall view, which still stands the test of time is a 1940’s Post-War grit, the dust is heavy and the sunlight wan. The audience feels enveloped in Don Corleone’s study and Michael’s Lake Tahoe Hacienda in a palpable, lived in manner. Whilst Pt 2. Was distinctly more romantic in terms of setting and technical features, the overarching structure remained. Behind every corner lurked danger, behind every smile, the promise of death and behind every kiss, a heartfelt betrayal. Furthermore, another element which underpins the strength of this Trilogy is undoubtedly the score, featuring the immortal, minor-key melody is the ephemeral product of Italian composer Nino Rota, best known for his compositions for the Neo-Realist films of Federico Fellini. Ostensibly, the score conveyed tragedy and sadness in equal measure. The evocation of the Corleone Italian heritage is indeed the foundation stone upon which Coppola elaborated his gangster saga. Significantly, the Neapolitan jazz stylings and a Sicilian melodic sensibility, the overall melancholy nature of life itself is imbued in every scene and shot. This theme is carried over to the divisive Pt. 3 of the Trilogy which whilst not as eminently popular as the first two outings, it certainly deals with the long-term effects of crime and the erosion of Michael’s soul to a withered bone. The cast reads like a who’s who of method acting. Robert Duvall, Al Pacino, Robert de Niro, James Caan, Marlon Brando, Diane Keaton, Andy Garcia all feature and without a doubt it is one of the most impressive ensembles every to grace the silver-screen. However, focus must be drawn to Al Pacino whom was given his big break in the original 1972 picture. This was despite heavy opposition from paramount who viewed this skinny and precocious actor as box office anathema. Nevertheless, could one imagine The Godfather without his powerful, quiet and ruthless portrayal of Michael Corleone? Arguably, one of the most enigmatic onscreen debuts since Brando himself in 1950’s The Men, the faith placed in Pacino by Coppola is reflective of the drive of this director to produce a piece of work crafted with original materials. Pacino, raised and breaded on the stylings and minutiae of Stanislavski at the New York actors’ studio has a self-possession that borders on compulsion. The picture, nay The Trilogy is augmented in droves by his portrayal. Not to mention that De Niro, who would later become one of the greatest actors of his generation was also involved in Pt. 2, illustrating that Coppola had the eye for talent that reached far into the future of cinema. Which bring us to the Director. Francis Ford Coppola – who would win the 1979 Palme D’Or at Cannes for psychological War Epic Apocalypse Now – established himself as the mandarin of cinema in 1972 and 1974 respectively. The plot, driven by the galvanic energy of Puzo’s text is aided by the masterful direction of each shot, every sequence and each slow-build. The director, whose layered approach to the art of directing actors ensured that this Trilogy would forever remain at the centre of popular culture. He also would find his work parodied, copied and honoured across 40 years in a plethora of ways. The Godfather Trilogy moves beyond words and achieves that immutable balance of power and poise. It is a tour de force in every sense, it is a stroke of cinematic glory and brings you deep down into the sea of the human psyche, to swim forever with the fishes.